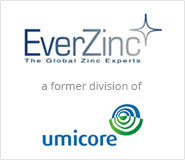 EverZinc Belgium (Zolder) (formerly SA Umicore Zinc Alloying) is the leading recycler of galvanizing residues in the world. Their plant in Heusden-Zolder, Belgium, has the capacity to process 30,000 metric tons of sintered zinc oxide which is used in their sister plant in Eijsden, The Netherlands, for production of high purity zinc oxide for animal feed products. The sintering process requires galvanizing residues to be processed in a rotary calcinating furnace at temperatures of 500°C. An elevator moves 80kg trays of the residue through the furnace. The bronze bushings that support the axles of the elevator had to be replaced every six months due to inadequate lubrication and excessive wear. Part and downtime cost were a concern. SWEPCO Field Service Representative Frank Kleijn recommended they switch to SWEPCO 115 Food Machinery Grease due to its superior thermal stability and excellent wear control. Annual savings of more than €2.500 in parts and downtime. EverZinc Belgium (Zolder) has been using SWEPCO lubricants since 2012 .